Requests asks that ten terrorists from Shalit deal re-arrested in recent operations not be freed again after breaching conditions. Attorney General Yehuda Weinstein submitted a request on Tuesday to cancel the re-release of ten of the terrorists released in the 2011 Gilad Shalit prisoner swap, who were recently recaptured in Operation Brother's Keeper. 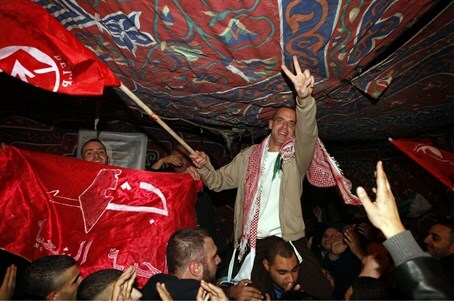 The ten terrorists were among the 1,027 terrorists released as part of an exchange for the abducted soldier Shalit. Their release came in the framework of pardons by outgoing President Shimon Peres, and through the discussions of a special release committee headed by a retired regional judge. Other terrorists were released through the order of an IDF general, after deliberation in an administrative committee headed by a military judge. Six of the ten terrorists are residents of the eastern part of Jerusalem, with four of them dwelling in Judea and Samaria. The state attorney has requested to cancel the conditional release of the prisoners and to return them to jail, where they would serve the remainder of their sentence from where they left off at the Shalit deal. All of the prisoners had been given a life sentence for their crimes. The argument behind the request is that the terrorists breached the conditions of their release, including through committed crimes. Those conditions for the terrorists' release in the Shalit deal included obligating them, among other things, not to harm the security of the state of Israel through any actions, including acts of terror or violence, or support and aid for such actions. It is not clear why the terrorists are currently being reconsidered for release again, having been rearrested for breaking the terms of their release. Over 50 terrorists released in the Shalit deal have been re-arrested in the recent operation. The Attorney General's call comes on the heels of the arrest of another terrorist prisoner released in the Shalit deal, who went on to murder Chief Superintendent Baruch Mizrahi Hy''d, as the latter was travelling with his pregnant wife and three of his children near Hevron right before Passover in April. After the attack, the terrorist reportedly told his son that his motive for murdering Mizrahi was religious, and that "according to the religion of Islam, everyone who kills a Jews goes to paradise." Mizrahi's widow Hadas responded to the arrest, saying her husband would still be alive if terrorists were not released. "Had they not had a bargaining chip, and had they not known that they can be freed - Baruch would have been alive. A death sentence is the solution and we would like to hope that the state of Israel will give terrorists death sentences, not a prison sentence that is a five-star hotel, and not a university for training for the next terror attacks," stated Hadas Mizrahi.